(TibetanReview.net, Jul22, 2016) – China’s organizing of a Kalachakra Teaching event over Jul 21-24 by the man it had chosen as the 11th Panchen Lama after abducting the boy recognized by Tibet’s exiled spiritual leader, the Dalai Lama, in 1995, has been condemned as a propaganda ploy by the largest exile Tibetan group, the Tibetan Youth Congress (TYC). Also, London-based Free Tibet campaign group said Jul 20 that the event was meant to further China’s continued attempts to impose its authority on Tibet by co-opting Tibetan Buddhism. Free Tibet said that while the event had come as a culmination of years of political and religious grooming by China of Gyaltsen Norbu as the 11th Panchen Lama, “none of (these) will grant him legitimacy in Tibetan eyes”. “His presence at this Kalachakra stems from the Chinese occupation rather than from genuine religious legitimacy. 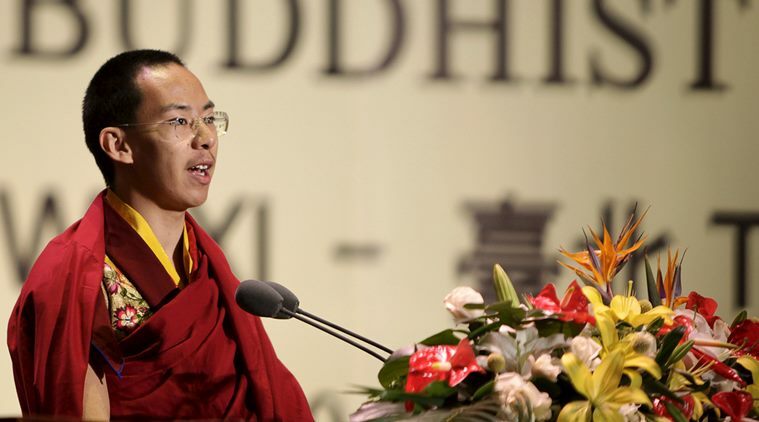 This is not the Panchen Lama that Tibetans want to see,” said Free Tibet director Eleanor Byrne-Rosengren. The Panchen Lamas, through a lineage of successive reincarnations, remain the second most influential figure in Tibetan Buddhism, after the Dalai Lamas, with the two often being called upon to play a role in recognizing each other’s reincarnation. However, in 1995 China abducted six-year-old Gedhun Choekyi Nyima just three days after the Dalai Lama formally announced his recognition of him as the reincarnation of the 10th Panchen Lama who had died in Jan 1989 in suspicious circumstances. A few months later, China installed Gyaltsen Norbu, whose parents were communist party members, as the 11th Panchen Lama. The fate or whereabouts of Gedhun Choekyi Nyima remains unknown to this day. The Kalachakra, Wheel of Time, teaching is the most popular to Tibetan Buddhists who flock to attend it in huge crowds. Tibet’s exiled spiritual leader, the Dalai Lama, gave this teaching in Tibet’s capital Lhasa in 1954 and 1956, and has given it 31 times thereafter outside his homeland. He is due to give another one at Bodh Gaya, Buddhism’s most sacred place, in Jan 2016.